They easily assume an almost mystical, mythological place in our minds, which then makes it all the more difficult to appreciate a present moment. As an adult, I've discovered that those delightful recollections of childhood Thanksgivings had unexpected repercussions. I'd try to recreate aspects of those bygone days, only to fail miserably because it never felt the same, at least not to me. I was on an express path to lose my love for what had always been my most treasured holiday. Don't get me wrong. There's nothing wrong with remembering. But there's so much wrong with trying to recreate what has passed... Instead, we have to draw from the past to build something new. 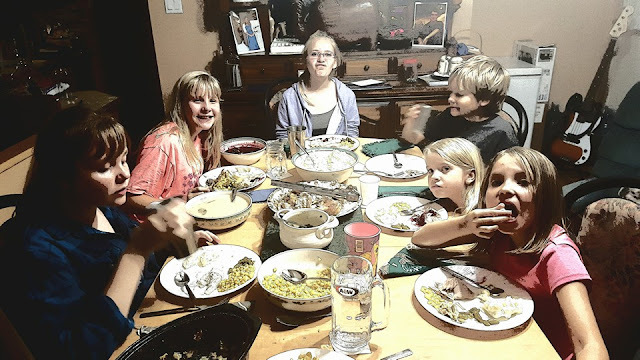 After we'd been living in Niger for a few years, we realized that our brothers and sisters in the church also celebrated a time of thanksgiving. Sometime in October, after the beginning of the school year (October 1), many churches observed a "Fête de Moisson," or Harvest Celebration. Invitations were sent to sister churches. Neighborhood children were invited. The church was meticulously cleaned, sometimes even repainted and decorations were strung from the metal trusses supporting the roof. A goat or sheep was slaughtered and slow cooked in a sauce we'd smell throughout the entire service. Everyone brought some food - or at the very least, a bag of hard candies or several bagged yogurts to share. Sometimes, there was even a case of cold, glass bottled Coke - for the men. A basket was placed in the front of the church and after the time of singing and a short sermon, everyone had several opportunities to sing and dance their way down the aisle, to the front and place gifts in that basket - first the elders, then all the men, then all the women, then the choir, then the children, then families - one by one... and on and on. Often, the women would buy yards of the same material from the market several weeks ahead of time and would show up to church in mostly matching outfits. There were games during the children's Sunday School time - sometimes prizes were handed out to children who recited their verses. At the conclusion of the service, we'd eat a meal together - men served first, often in groups of 5 or 6 sitting around a large plate piled high with the rice and sauce that had been awfully distracting during the sermon. Then children would be served... and finally the women would eat together. Usually everyone ate with their hands. Sometimes - trying to be nice, they gave us - the missionary family - spoons to use. We always smiled and said thank you - and never said that it was actually more fun to eat with our hands. I can't say that I loved it... this Thanksgiving celebration... NOT the first time. But it grew on me. The past few years, I've missed watching my children dance and laugh and clap their way to the front of the church - and the offering basket - while our African family danced and laughed and clapped with them. This year, we celebrated Thanksgiving in Canada. Canadian Thanksgiving's beginnings are more closely identified to European traditions than to New World unity. Many decades before Europeans settled in North America, festivals of thanks and celebrations of harvest took place throughout Europe during the month of October. It is generally agreed that the first Thanksgiving celebration in North America actually took place in Canada, when English explorer Martin Frobisher landed in Newfoundland. He was thankful for safety as he traveled across the Atlantic. He arrived 43 years before the Pilgrims landed in Massachusetts... 1572. 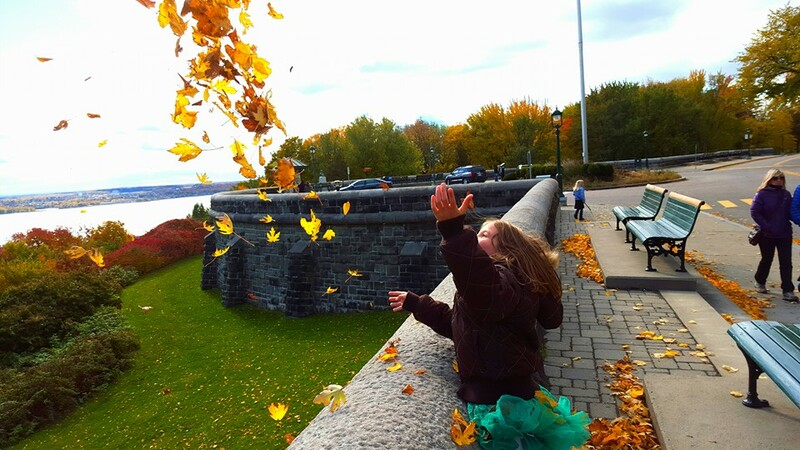 I've only ever celebrated Canadian Thanksgiving in Quebec; according to what most have told me - it isn't nearly as big of a deal in Quebec as it is in Ontario and western Canada (nobody really said anything about further east). At most, it is a three day weekend to spend time with family. More typically, it is a bit of a party weekend, with Monday as the official holiday. After our traditional Thanksgiving meal (with from-scratch cranberry sauce, for the first time ever), our daughter and her friend went out door to door in our neighborhood. They were collecting pop and other cans for recycling (it's a common way students here raise funds for school activities). Her friend said it would be a great weekend - lots of beer bottles to collect - and she was right. We filled our SUV with garbage bags full of bottles and cans. Even the passenger side front seat was packed, and the girls had to walk to the return center while I drove to meet them. Our church did have a meal after the service on Sunday, which was a fun time to fellowship, eat delicious food and visit. But we couldn't hang out all day as we rent a room and had a deadline by which we needed to be cleaned up and cleared out. The Christian school our children attend gifted families with a four-day weekend - and the last Thursday afternoon was spent watching students (dressed in "Fall" themed/colored costumes) participate in an annual competition: the Autumn Leaves Race. Many parents were at the school to cheer their kids on, and it seemed like fun was had by all - even the highschoolers who had to reluctantly run 2+ kilometers. We're still figuring out Thanksgiving here. We live near a First Nations/Native American reservation. I'd love to find out if they have any type of harvest celebration! Next year, maybe! One of the things about being in different places and missing our traditions is that it has helped me pinpoint the things that are the most important or meaningful about various holidays. I always thought it was the food for Thanksgiving. While in the US when our kids were small, we were too far from family to visit for the holidays. We joined another gathering or gathered people at our house. Our first Thanksgivings in Congo, we had a meal with other Americans, and something was always missing for me. I thought it was just having different foods (and never quite a feast) and being away from family. 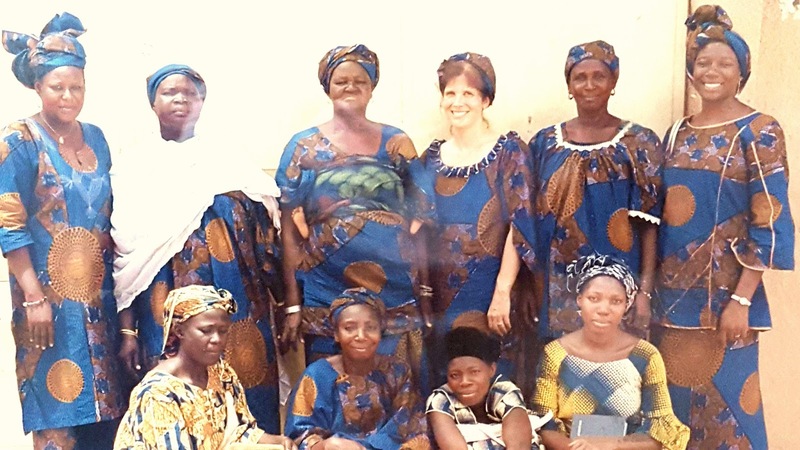 The 4th year we were in Congo, we hosted the American meal at our house. I was determined to have lots of food to share. We were living on the hospital compound, so I knew that there would be plenty of opportunities for that. The night before, I was incredibly sick. This isn't as bad as it sounds since I had a cook coming to do the cooking for me & other cooks involved in the meal. But I was flat on my back the whole time. My husband was called in for emergencies & surgery, so the kids hosted everyone at our house. And then, the whole surgical team came and ate. Then the nurses and guards got to have a meal. Love this story (not that you were sick) and what you learned. I agree!!! I often choose to invite someone over for my birthday - instead of letting people make the day all about me, I try to make it about sharing with others.